Just Julie B's Stampin' Space: Toxic Treats Decor Gift Set by ME! Toxic Treats Decor Gift Set by ME! It seems like Halloween Home Decor just gets more and more popular each year! So why not make some of your own? This framed art is a fun and easy way to make a great piece of Halloween Decor that is sure to delight! Add a great pumpkin tote with a candy treat – and you’re on your way to being ready for Halloween. Make this fun project as a gift, and make sure to make more than one and keep one for yourself! This fun Halloween set was made by ME!! And you can get the tutorial for it over at Craft Project Central this month! This is so cute! I love your project this month. Halloween is my favorite. I have home decor everywhere and I can't wait to make this too! 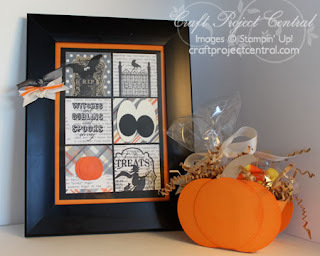 Spooky Treats Set & Card! Happy Birthday to my Sis! Googly Ghouls for a Challenge! Quick n Easy Birthday Card for a Boy! Evolution of the Embossing Folder! A Little Bit Halloween this Friday! A Perfect Football and a Quick Tutorial!